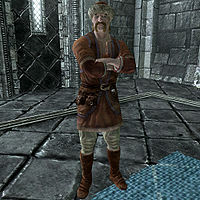 Jorleif is a Nord citizen employed as a steward to Jarl Ulfric Stormcloak of Windhelm. He resides in the Palace of the Kings. 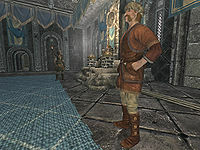 After successfully taking the Imperial Fort Neugrad for the Stormcloak rebellion, Jarl Ulfric will offer you the ability to purchase Hjerim, a house in Windhelm, which Jorleif will sell to you for 12,000 gold, but will accept as low as 8,000 if that's all you have, as well as offering you upgrades for the house. Like other stewards, he will also provide bounty notices for his hold and will pay you after completing these bounties. Jorleif begins his day at 5am by getting out of his bed in the upstairs area of the Palace of the Kings, and going downstairs to the throne room to attend to his duties. He will stand at his post besides the throne until 11am, at which point he will take a seat at the long table in the center of the room to have a lengthy lunch. He will then return to his post at 2pm for the rest of the day. Jorleif will finally retire from his duties for the day at 10pm, returning to his bed so that he may repeat his schedule the next day. Jorleif wears a set of merchant clothes along with a hat and a pair of boots. He also keeps a belted tunic on his person. Besides those items, he wields an iron dagger to defend himself and carries a selection of upper-class loot and gold. While the Stormcloaks still hold control of Windhelm, he may greet visitors by claiming that: "The Stormcloaks are finding victory across the land." He will also admit his own inability to adequately assist with the tactical side of the war effort: "I'm not much of a strategist, but Lord Ulfric listens to my counsel all the same." 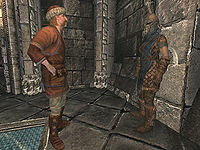 Jorleif will additionally direct you to talk to Ulfric if you have any information pertinent to the ongoing conflict: "If you have any news of the western holds, take it to Ulfric immediately." Should the Imperial Legion take control of the city, he will admit that while he misses Ulfric, he was a harsh taskmaster: "Serving as Steward to Ulfric Stormcloak was a great honor, but I don't miss his temper." Furthermore, he will claim that he is just happy the rebellion is finished: "I don't care that we lost, I'm just glad the war is over." While a serial killer is running rampant through the city, he may remorsefully comment on the victims: "Terrible shame, what happened to those women." 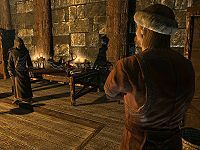 Asking Jorleif what duties he performs for the jarl while Ulfric controls the city will have him say: "For Ulfric? Oh, nothing official. Known him for years. He seems to value my thoughts, and I'm grateful for that. I don't really have a mind for war, and I think he likes having an untrained opinion from time to time." Likewise, you can also ask him about Windhelm in general while the civil war still goes on: "Grew up here. Colder [sic] as Atmora, but that just grows the beards thicker! Lot of history in these walls. We're trying to make some more. It's a lucky time to be alive." Attempting to purchase a house here before completing the quest Blood on the Ice will have him deny your request by saying: "There is an empty home in the city, but there was some... unpleasantness recently. I'm afraid it's not available just yet." Ending a conversation with Jorleif may have him say: "Travel safely. It's dangerous out there." If he is on his lunch break, he may instead announce: "If you'll excuse me, I must return to my duties." "We're finally going to arrest the Butcher." "Has the whole city lost their brains?" After a few visits to Windhelm, you may discover a woman named Susanna the Wicked murdered in the middle of the cemetery. Speaking to the guard handling the scene, and offering your assistance, will eventually lead to them directing you to speak to the steward: "Look, friend, if you think you can do better than the legion of guards, be my guest. You'll need to talk to Jorleif, though. We can't just let anyone go around claiming to be on official business. If he's willing, then we'll talk." Jorleif: "You. You're coming with me. We're finally going to arrest the Butcher." Jorleif: "You're under the arrest, for the Murder [sic] of Susanna of Candlehearth Hall. And Friga Shatter-Shield. And all the rest. We're wise to your scheming, you coward." Jorleif: (to Wuunferth) "Make your excuses from the Bloodworks, wizard." (to Guard) "Get him out of my sight." Guard: (to Jorleif) "Yes, sir!" (to Wuunferth) "I'm sorry, sir. But you'll have to come with me." However, this turns out to be a false trail, with the killer striking again a few nights later. Once the real killer is apprehended, you can report your success to Jorleif: "I'm glad you were able to correct your mistake. I'll release Wuunferth immediately. You've done this city a mighty service, friend. I believe you'll find the guards to be a bit more cordial with you in the future." If you had confronted Wuunferth before, instead of going to Jorleif to have him arrested, you will instead have the chance to report your success in defeating the real murderer: "Ysmir's beard! The man was always a bit odd, but I wouldn't have expected... You've done this city a mighty service, friend. I believe you'll find the guards to be a bit more cordial with you in the future." Ulfric: "Galmar thinks we should double our men in the Reach." Jorleif: "Well, sir, the hold of Falkreath is fairly vulnerable, and blocks the only road from Cyrodiil." Ulfric: "A good point, old friend. " Jorleif: "To be sure, my lord, I am not skilled in the arts of war or military tactics." Ulfric: "But you're able to see the whole in the parts, and for that I'm grateful." Jorleif: "As you wish, sir." Jorleif: "Sir, there continues to be unrest in the Gray Quarter." Ulfric: "Blasted dark elves. I don't suppose you could tell them that I presently have larger concerns? Such as all of Skyrim?" Jorleif: "They don't seem to be very sympathetic to our cause, sir." Ulfric: "Let me know if you hear anything more substantial?" Jorleif: "Of course, my lord." Ulfric: "Jorleif, I want you to send a messenger to our western camps." Jorleif: "And the message, sir?" Ulfric: "I'm diverting Gar and Haddring's men to join him." Jorleif: "Is that wise, sir?" Ulfric: "It will work if we can pull Hran's men from the south. And find a bit of luck." Jorleif: "Of course. Something that seems to be in short supply these days." Ulfric: "I'm not seeking advice right now, friend. Just send the message." After the Imperials take Windhelm, Captain Lonely-Gale is supposed to take over as steward, but never does because Jorleif is never exiled.